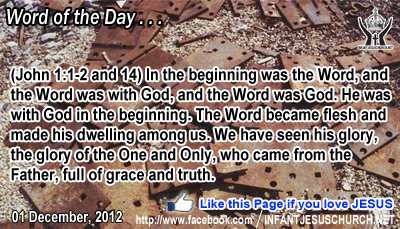 John 1:1-2 and 14: In the beginning was the Word, and the Word was with God, and the Word was God. He was with God in the beginning. The Word became flesh and made his dwelling among us. We have seen his glory, the glory of the One and Only, who came from the Father, full of grace and truth. Holy and Righteous Father, thank you for putting us where we are. We know we are here to do your work and carry on Jesus' ministry. Help us grab the opportunities you give us today to bless others in the name of Infant Jesus. In His name of our Lord w pray. Amen. 34"But take heed to yourselves lest your hearts be weighed down with dissipation and drunkenness and cares of this life, and that day come upon you suddenly like a snare; 35for it will come upon all who dwell upon the face of the whole earth. 36But watch at all times, praying that you may have strength to escape all these things that will take place, and to stand before the Son of man. Jesus is always very present and ready to give us whatever guidance and help we need to fight temptation and to stay the course which he has set for us. But there is one thing he doesn't bear: indifference, an approach of not caring, and doing nothing! The Lord wants us to cast our anxieties on him and to trust in his supervision and help. Do we seek the Lord and his strength? in anticipation of the Lord Jesus comes again we can expect that there will be troubles, trials, and temptations in this world. Our enemy the devil does not rest in his many attempts to tempt us away from God and his will for our lives. If he cannot do well in getting us to renounce our faith in Jesus, he will try, gradually, to distract us from pursuing the things of God, particularly prayer and listening to God's Word in Scripture. Let us ask the Lord to rekindle in you the fire of his love and the joyful hope of seeing him face to face when he comes back again. Loving Infant Jesus, rouse our spirit to the truth that this world is passing away. Give us a lively faith, a joyful hope, and an ardent love to see you face to face when you return in glory.